We have recently covered state laws preempting local control, especially in North Carolina and Tennessee. State governments are supposed to be “laboratories of democracy” and municipalities are sub-parts of the state. Preemption is ostensibly to prevent problems, but instead these state laws limit local governments’ solutions for ensuring better connectivity. At the same time, people trust their local government more than their state government to handle problems. That’s the latest finding from Gallup’s most recent Governance Poll, and that makes sense for all of us following community networks. It's no surprise that trust starts with local community leaders. We have spoken to a number of public officials that acknowledge that when you know your elected official - perhaps live down the street from them or run into them at the grocery store - it's much easier to know that they share your hopes for the community. Gallup’s September 7th-11th Governance Poll found that 71 percent trust their local government to handle problems, but only 62 percent say the same about their state government. This continues a fifteen-year trend of people putting their faith in local government more than in state government. 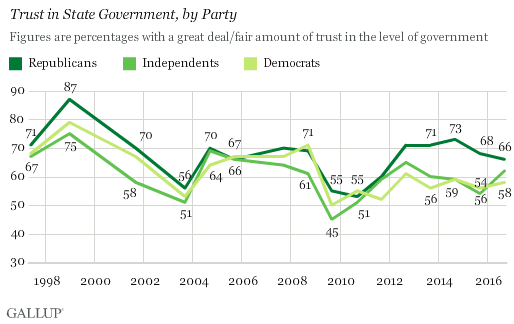 Seventy-five percent of Republicans stated that they have a "great deal/fair amount" of trust in local government. (Compare to only 71 percent of Independents and 66 percent of Democrats.) This corresponds with what we found in January 2015 while analyzing our data. Most citywide, residential, municipal networks are built in conservative cities. 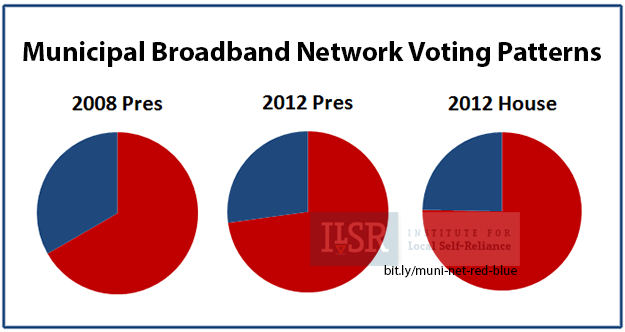 They trust local governments to solve connectivity problems when the big providers can't or won't deliver. Since our founding in 1974, we have worked to rewrite the rules and empower communities to choose their own future. Across several vital economic sectors, we help break the corporate stranglehold that extracts wealth from local economies and undermines democracy. We give communities the tools to build a strong local economy themselves. From banking to energy, healthy soils to community-owned Internet networks, time and again we have shown that when we level the playing field for individuals and businesses, we improve our economy and the quality of life for all citizens. Support our work to help communities down the path to local self-reliance. This video illustrates our work, and explains how all of our unique and distinct initiatives, together, build a holistic philosophy of local self-reliance. Once again, local communities in Colorado chose to shout out to leaders at the Capitol and tell them, "We reclaim local telecommunications authority!" Akron, population 1,700 and located in the center of the state, passed its ballot measure with 92 percent of votes cast supporting the opt-out. Buena Vista, also near Colorado's heartland, chose to approve to reclaim local authority when 77 percent of those casting votes chose to opt out. There are approximately 2,600 people in the town located at the foot of the Collegiate Peaks in the Rockies. Here is Buena Vista's sample ballot. The town of Fruita, home to approximately 12,600 people, approved the measure to reclaim local authority with 86 percent of votes cast. Now, when they celebrate the Mike the Headless Chicken Festival, the Fruitans will have even more to cheer. Orchard City, another western community, approved their ballot measure when 84 percent of voters deciding the issue chose to opt out. There are approximately 3,100 people here and a local cooperative, the Delta-Montrose Electric Association (DMEA) has started Phase I of its Fiber-to-the-Home (FTTH) network in the region. According to an August article in the Delta County Independent, Delta County Economic Development (DCED) has encouraged local towns, including Orchard City, to ask voters to opt out of SB 152. With the restriction removed, local towns can now collaborate with providers like DMEA.